We’ve got a denim shoe post for everyone today, and we’ve got not just one but three styles to feature. All of these denim shoes are from Taccetti, an Italian shoe label with a heavily feminine-inspired Spring/Summer 2012 collection. So, it’s really surprising to see these rough ‘n tough denim shoe styles included in its lineup, especially since the denim fabric they used is distressed, sanded, and frayed along the edges. 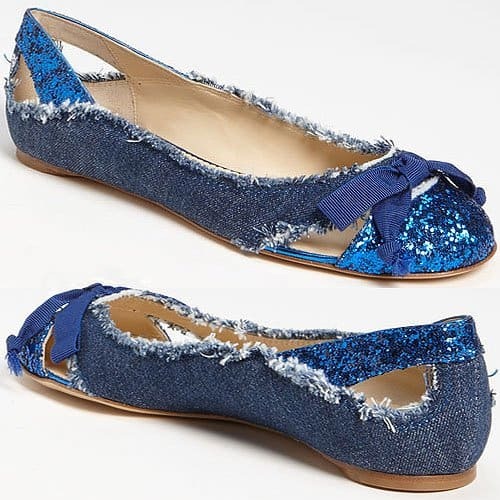 But all that simply means more things to fawn over for us denim fanatics, and we are doing exactly that with these denim flats, pumps, and boots. We adore the cutouts and the blue glitter on the flats and the orange piping on the boots. And how cute is that pink glitter heel against the denim on the pump? The pops of color on these shoes make them easier to pair with other denim clothing, which, as many of you may know, is a major dilemma when it comes to denim shoe mixing and matching. As if our closets didn’t have enough denim, here are even more denim items for our shoe closets. Chunky glitter bookends a bow-topped flat with statement sparkle. Chunky glitter perfects a precocious, pointy-toe pump set atop a towering heel. 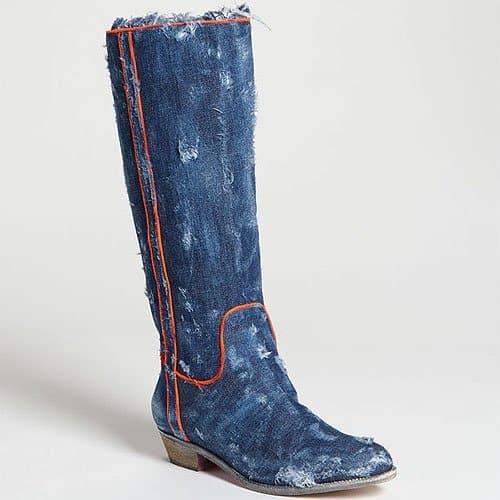 Distressed denim dominates a Western-cut boot finished with neon grosgrain for a noticeable jolt.